Members - The New York State Society of Anesthesiologists, Inc.The New York State Society of Anesthesiologists, Inc. Members - The New York State Society of Anesthesiologists, Inc.
By being a member of the New York State Society of Anesthesiologists, you join a community of approximately 3,600+ New York anesthesiologists and more than 35,000 anesthesiologists nationwide. NYSSA advocates on behalf of both patients and physicians in formulating standards and guidelines, to advance the practice of anesthesiology. Together, NYSSA members provide a powerful and effective voice for our specialty, both in New York State and nationally. Lobby and voice your views to your legislative representatives on issues of critical importance. 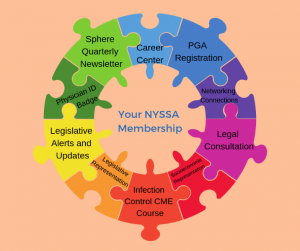 This comprehensive suite of resources and services are included in an annual NYSSA membership and provide an immediate return on every dues dollar you spend. Each of these member benefits has been specifically selected to support you and your patients, your practice and your specialty.